Kailin Gow introduces a world of Greek mythology unlike any other world before. The complex mysteries of the gods and demigods will draw readers in from the very beginning along with The Fire Wars' imaginative dystopian structure. Mackenzy Evers is new to Aeros island and as soon as she begins her senior year at Aeros Academy she is presented with unfathomable legends turned into reality. Her undeniably fiery attraction to Chance versus the calming effect of one touch from cool as a cucumber Varun will become the least of her worries. Learning that her destiny could entail saving the world from further erosion, or destroying it, puts Mac in a precarious situation. There doesn't seem like enough time to get to know the Mac outside of her possible destiny before she is whisked away by the two intense cousins, Chance and Varun Cutter. The sweet whirlwind romances are to be expected, though, as they are popular trademark of Kailin's novels, but Mac still remains a big mystery. Despite the tantalizing mystery surrounding Mac's fate, the world building and underlying real-world environmental themes stand out in The Fire Wars, setting the award-winning novel apart from other young adult greek mythologies and dystopians. 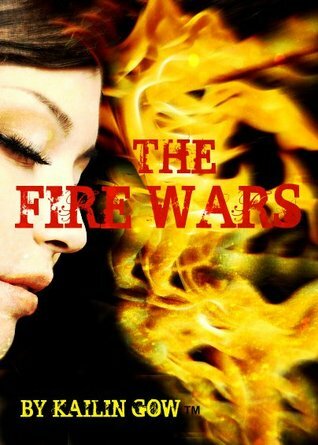 Thankfully The Fire Wars is only the first in a series written to dazzle readers and pepper them with a taste of Kailin's brilliance when it comes to mixing genres and keeping readers guessing when it comes to matters of the heart! With an ending as catching as The Fire Wars', it's safe to assume that book two, Fire Stones, is going to be a sure-fire read!